January 6, 2016 - 3 Comments. My ClassPass membership allows me to check out tons of local fitness studios, over and over again. This post is hopefully the first in a series of reviews of these studios. First up is CrossTown Fitness, which I have talked about before on this blog, for good reason – it is a great studio! They have locations in the West Loop at Lakeview, however, I have only been to the West Loop location. In a nutshell: HIIT (high-intensity interval training) workouts, all day, every day. Every class is different (unless you attend back-to-back classes). But you’ll be working out on the treadmill, rowing machine, using kettlebells, dumbbells, medicine balls, pull-up bars, equalizers, TRX, ropes, and your own bodyweight to get in a great workout. Level: Their workouts are scalable. You pick your own weights and work at your own pace. I’ve had to pop outside for fresh air more than once during a workout, or walk during a run interval, and no one shamed me. But if you’re up for a challenge, you can definitely be challenged! They also offer personal training sessions, and an open gym for members when class isn’t in session. Instructors: The trainers are all friendly and approachable, with lots of energy, and always willing to help improve your form. However, I will admit that I get nervous about classes led by Tres, he’s either a Navy SEAL or built like one. I love classes with Betina and Kailee. Workout space: It is spacious and somehow even in a class with 30+ people, it never feels crowded. All of the equipment has a spot, and participants typically help with clean up after class ends (which goes quickly with 30 people). The equipment is all in great shape (approved also by https://fitnessgeko.com/). The rest of the space: There is a waiting area up front, the reception desk doubles as their Cafe, there are cubbies and coat hooks and lots of spots to sit down if you’re waiting for class to start. In back are clean, spacious single-person bathrooms, some with showers, that are stocked with various essentials. There is also a daycare room, obviously I have no experience using it. In addition to selling smoothies and some food, they also sell CTF branded apparel. Overall: If you are looking for a challenging workout, no matter your level, that is different every day, with friendly energetic instructors, check out CrossTown Fitness! 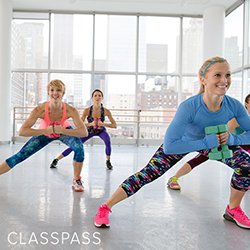 You can sign up via ClassPass if you’re a member, or check their schedule at crosstownfitness.com for their free “community” classes or their great intro deals. Have you been to CTF? Who is your favorite trainer? Any particular studios you’d like me to review? Run ALL the races! And my jeggings are too big. Previous Article Making it work. Or moving on. Betina has always been my favorite trainer, there. Her energy is just so contagious! I miss starting my day out with one of her classes. I’ve always had a good experience at CTF. I really want to check out their Lakeview location one of these days! I had a trial personal training session with Kailee just about a year ago and liked her a lot more than the trainer I worked with during marathon season in 2014. Definitely one of the better studios in Chicago, in my opinion! No reason to be afraid of Tres! Just maybe don’t take like 5 of his classes in one week! But seriously he always scales his classes based on everyone’s own abilities! Never did anything that I couldn’t do because I always scale the exercise. For example I do step ups instead of box jumps.